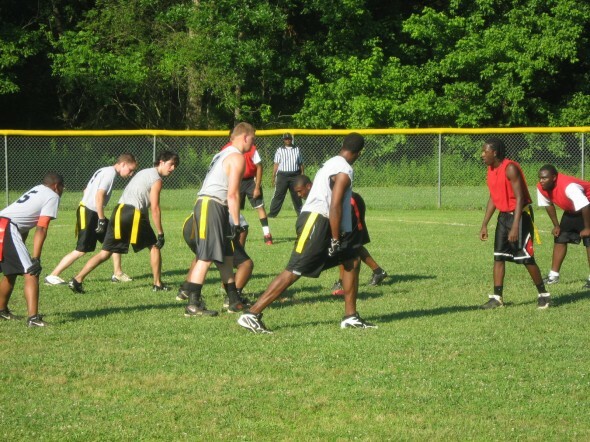 Entering its third year, the Acworth Parks and Recreation Department’s Adult Flag Football League has more than doubled in size since its inception in 2009. Hosting 11 teams and over 120 participants in 2010, its largest season yet, the league is excited about opening registration for Spring 2011. Offering statistics, player(s) of the week, records, write-ups and box scores after each game, and the SuperJoe Bowl Championship to end post season play, the Acworth Adult Flag Football League is a joyful experience for those football fans that still love to play the game. Game play is 7 on 7 though teams may have a roster of up to 17 players. All games are played on Tuesday and Thursday evenings at Amos Durr Field with no cost to spectators. Start building your team and dynasty today! Team registration fee is only $350 which covers all your league expenses. Teams are responsible for providing their own jerseys. If you do not have a team, come out and participate in our Free Agent Sign-Up Day Monday, March 14 at 7:00pm located at Amos Durr Field. Free Agent registration is $35.00 and teams will be selected. To view the latest updates, information, or player statistics you can visit www.acworth.org/aprd or www.leaguelineup.com/acworthflagfootball . REGISTER NOW! For more information please call the Acworth Parks and Recreation Department at 770-9127-1234 or email jwhite@acworth.org. Wish we could have a fall season again too! !